ILH | What Does ILH Mean? 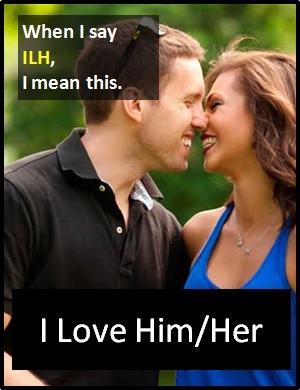 ILH means "I Love Him" or "I Love Her". Tom: Jane is beautiful, bright, sweet and kind. ILH and I want to spend the rest of my life with her. Jane: Tom is so funny. ILH. (Even though he is a bit intense sometimes.) He's one of my best friends. ILH and she loves me. Ken: Garry's such a laugh at work. Kerry: Are you over Tom yet? Linda: Not really, it's hard. ILH so much. ILH is typically used as a standalone declarative sentence (i.e., a statement). It is not normally used as another part of speech within a wider sentence. As it is pronounced using its individual letters (i.e., "Eye Ell Aitch"), ILH is classified as an initialism abbreviation. Initialisms are different to acronyms, which are spoken like words. Before the digital era, we would have just said "I Love Her" or "I Love Him", or maybe something like "She's So Sweet" or "He's So Cool" instead of using ILH.